While the rate of skilled care during childbirth has increased from 58% in 1990 to 78% in 2016, mostly due to increases in facility-based births, giving birth in a health facility does not equate with a safe birth. The World Health Organisation (WHO) estimates that 303,000 mothers and 2.5 million newborn infants die annually around the time of childbirth, and many more are affected by preventable illness. A further 2.6 million babies are stillborn each year. Improving quality of care – to a point where health care is safe, effective, timely, efficient, equitable and people-centred – and patient safety is therefore critical if we want to accelerate reductions in maternal and newborn mortality and meet the Sustainable Development Goals. Source: WHO. World Health Statistics 2016. 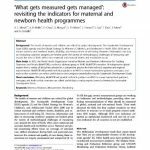 Monitoring Health for the SDGs Geneva: World Health Organization, 2016. 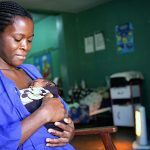 In response to this imperative, nine countries – Bangladesh, Côte d’Ivoire, Ethiopia, Ghana, India, Malawi, Nigeria, Tanzania, and Uganda- are leading the the Network for Improving Quality of Care for Maternal, Newborn and Child Health (Quality of Care Network), launched in February 2017, to ensure that every pregnant woman and newborn receives good quality care throughout pregnancy, childbirth and the postnatal period. 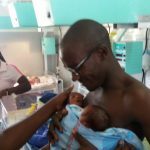 It addresses quality of care both in the way it is delivered by health workers, and experienced by patients, with the ambitious goal to halve maternal and newborn deaths and stillbirths in health facilities within five years in the participating countries and to improve the experience of care. The Quality of Care Network is supported by the World Health Organisation, UNICEF and UNFPA, and a growing partnership of development organisations, NGOs, professional associations and universities. 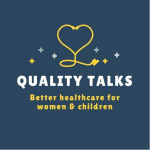 The Quality of Care Network is underpinned by the values of quality,equity and dignity and contributes to achieving the targets of the Every Woman Every Child Global Strategy for Women’s, Children’s and Adolescents’ Health. More countries will join the Quality of Care Network from 2020. Focus on national leadership by strengthening national and district governance quality of care structures, and helping develop national plans and advocacy strategies for improving quality of care. 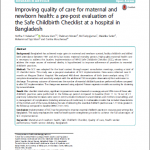 Accelerate action by adapting and adopting WHO’s eight Standards for improving quality of maternal and newborn care in health facilities at country level, creating national packages of quality improvement interventions and develop, strengthen and sustain clinical and managerial capabilities to support quality of care improvement. 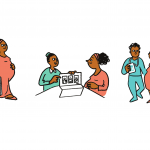 Foster learning and generate evidence on quality of care through a Learning Platform – a community of health practitioners from around the world co-developing and sharing knowledge, country data and research to inform maternal and newborn quality of care improvement work in countries. The Learning Platform’s outcomes will feed into the WHO-led Global Learning Laboratory for Quality Universal Health Coverage. Develop and support institutions and mechanisms for accountability for quality of care by designing a national accountability framework, and monitoring the progress of the Network for Improving Quality of Care for Maternal, Newborn and Child Health. 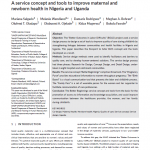 Connecting the dots: Designing a more connected journey for pregnant women in Nigeria and Uganda to access quality care at time of birth.